Evan Kline-Wedeen is a licensed patent attorney whose intellectual property law practice encompasses patent preparation and prosecution, IP litigation, patent post-issuance proceedings, and product clearance and legal opinions. He drafts responses and performs technical due diligence for appeal and post-grant review proceedings before the Patent Trial and Appeal Board and supports the litigation team in other matters through legal research and document preparation. Evan drafts patent applications directed to a variety of arts, primarily working with clients engaged in the fields of biomedical engineering, mechanical engineering, and material science. While attending Chicago-Kent College of Law, Evan gained experience in IP law as a law clerk with Fitch Even and at two other Chicago-area boutiques. His responsibilities at these firms included preparing appeal briefs, drafting patent applications, responding to office actions, and performing prior art searches. 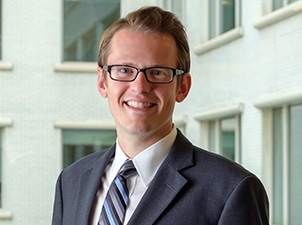 In addition, Evan served as a volunteer law clerk at the Chicago-Kent Patent Hub, assisting attorneys with filing patent applications and providing pro bono legal assistance to low-income inventors. He also spent a year working as a legal research assistant at The Law Lab at Chicago-Kent. During his final year in law school, Evan and his teammate took top honors at the national finals of the INTA Saul Lefkowitz Moot Court Competition, winning best oral argument and second place for brief. Evan was recognized with several other academic honors during his law school and undergraduate years.